the adlards » Blog Archive » Araf! 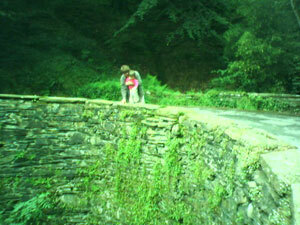 Josie and Heather looking at a stream in a verdant Welsh landscape. So verdant it seems to have turned my camera green. Pete and Ros came to say goodbye this morning before we left for Wales. They head back to South Africa next weekend to take up appointments in East London (where, as anyone who’s anyone knows, all roads lead). It’s been wonderful to have them around these last six months. Pics in the gallery. It’s good to have your wife drive occasionally. The trip to Abersoch with an infant and toddler was relatively painless – just eight hours or so. Sophie finds the car soporific, a trait Josie certainly doesn’t exhibit. I suppose we should have expected that, given that Michelle’s contractions stopped every time we got into the car to go to hospital to have Sophie. We only had one traffic policeman pointing a radar gun at us in North Wales and were presumably travelling close enough to the speed limit at that point to escape unscathed. On arrival, Josie began to discover the joy that water pistols bring. For a while she could only trigger the pistol she’d found with her thumbs. Much hilarity as she chased Nan around the garden thoroughly drenching her own face. Then she figured out the classic double-forefinger trigger action and the rest is history. I didn’t dare take the camera anywhere near or I would publish pics of the resultant carnage for your general edification. Today was wet and rainy, which was a relief after the heat and a pleasure to drive in. Apparently the heat begins again from tomorrow – absolutely perfect. We’re going to have fun. This entry was posted	on Saturday, June 25th, 2005 at 9:48 pm	by james and is filed under Family, Josie, Sophie. You can follow any responses to this entry through the RSS 2.0 feed. You can leave a response, or trackback from your own site.